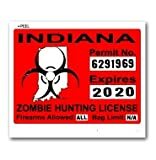 Indiana Zombie Hunting Permit Decal Danger Zone Style from Weston Ink. Designed and produced by Weston Ink right here in the U.S. using the highest quality materials and latest printing technology. New inks also extend the life of the graphic for years to come without any fading. We have thousands of designs and colors to choose from so do not forget to look at our other items as well. This product is a interior wall graphic. Designed to indoor use only. It is made from a material that is much like wall paper with the adhesive already applied. They will not harm your drywall or paint should you decide to remove them. They are applied dry like all of our other graphic just made for safe use on an indoor surface. 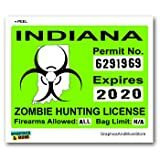 Indiana Zombie Hunting Permit Decal Danger Zone Style from Weston Ink. Designed and produced by Weston Ink right here in the U.S. using the highest quality materials and latest printing technology. New inks also extend the life of the graphic for years to come without any fading. We have thousands of designs and colors to choose from so do not forget to look at our other items as well. This product is reflective. Made from the same materials used on emergency vehicles, our reflective products look just the same as the non reflective designs during the day but at night when light hits them they reflect grabbing your attention. With our special 7 color translucent ink reflective process all the color within the graphic reflects. It's a great attention grabber for your vehicle as well as a great safety feature at night. 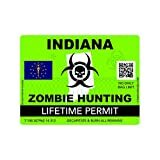 You will receive from Prosticker (Two) 3" x 4" "Indiana" zombie permit 1224 "Zombie Series". Indoor/Outdoor decals contoured cut to the shape of the image. Designed and manufactured by ProSticker. Printed on professional grade vinyl with exterior grade inks with a clear lamination to protect against scratches, UV rays and chemicals.For superior outdoor durability and longevity. Will hold up in all weather conditions. Bulk Quantities and Custom Orders are our specialty. Be assured all of our sales are "Square & on the Level" Your satisfaction is guaranteed. Order today with confidence. Enjoy. 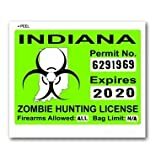 Indiana Zombie Hunting Permit Decal Danger Zone Style from Weston Ink. 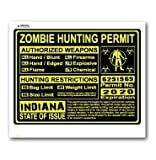 Designed and produced by Weston Ink right here in the U.S. using the highest quality materials and latest printing technology. New inks also extend the life of the graphic for years to come without any fading. We have thousands of designs and colors to choose from so do not forget to look at our other items as well. 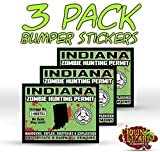 Sticker Stand® patented outdoor grade vinyl allows for air bubbles trapped under the film during installation to simply be pressed out with a squeegee. Our vinyl has an outdoor durability lifespan of over 7 years and is UV and waterproof. Stickers are digitally printed then die cut around the image. Easy application, will stick to all types of flat surfaces - bumpers, car windows, lockers, binders, metal, wood. Directions: Ensure that the surface that you are applying the sticker to is dry and clean. Stick the adhesive backing to the desired surface.